Picture of three people on computer helping each other. Versions below the supported OS and browser versions are not TLS 1.2 compatible by default, and some versions below those supported are not TLS 1.2 compatible at all. Mozilla Firefox end-of-life for version 59.0.x is on May 8, 2018. The recommended version is the Firefox version 60.x product line after May 2018. If using Microsoft IE version 11, and an error message is displayed, “Stronger security is required”, then turn off the TLS 1.0 setting in Internet Options | Advanced Settings. If using Microsoft IE version 8, 9, or 10, the browser is only TLS 1.2 compatible when running Windows 7 or higher, but not by default. Windows Vista, XP, and earlier versions are not TLS 1.2 compatible and cannot be configured to support TLS 1.2. Safari is installed on all Apple computers. You should not need to download it for OS X, MacOS, or iOS. But you should make sure it is always up-to-date by using the Software Update feature in the App Store. Versions below the supported versions are not TLS 1.2 compatible by default, and some versions below those supported are not TLS 1.2 compatible at all. PDF content requires a recommended PDF reader. Visit Adobe for more information about available Adobe PDF readers. Transport Layer Security (TLS) is a cryptographic protocol that provides privacy and data integrity between two applications communicating over a network. It is the most widely used security protocol in use today and is used by web browsers and other applications that require data to be securely exchanged over a network. TLS is designed to prevent eavesdropping and tampering of data. TLS replaced its predecessor, Secure Sockets Layer (SSL), in June of 2015 due to numerous security vulnerabilities in the SSL protocol. The SSL protocol was also deprecated by the National Institute of Standards and Technology (NIST) in 2014 for the same reasons. The Payment Card Industry Security Standards Council (PCI SSC) suggests organizations migrate from TLS 1.0 to TLS 1.1 or higher before June 30, 2018. To comply with this movement towards a safer and more secure method of transmitting your data, First Bank Texas requires all customers to access online systems using web browsers and applications that are TLS 1.2 compatible by default. Due to this constraint, you may be required to upgrade you web browser prior to using our new systems. The following procedure may be used to enable TLS 1.1 and 1.2 in your browser. Keep in mind, the minimum supported browsers will have TLS 1.2 support by default. These procedures are only relevant to unsupported browser versions. Click Alt + T and select Internet Options. Scroll down to “security.tls.version.max” and press Enter. Click Alt + F and select Settings. In the “Security” section, locate and check Use TLS 1.1 and TLS 1.2. Check Enable TLS 1.1 and TLS 1.2. TLS 1.1 and 1.2 are enabled by default. There are no options to enable/disable TLS if you are using Safari version 7 or greater. You log in to a system by entering a username and password (factor #1: something you know) and then you are required to enter or verify a code sent to your mobile device (factor #2: something you have). It supports a variety of authentication methods. Easy-to-use push notifications – no more 6 to 8 digit codes to enter! It’s free up to 10 users which is great for personal use. Duo also has paid plans which is great for organizations who wish to protect their users, devices, and apps. Supports multiple trusted users and multiple trusted devices, all controlled by you. Duo is integrated into our online banking solutions for authentication not just at the time of login, but at various stop points which you can control with a quick call to your local bank branch location, or secure message via online banking. It’s easy to setup. Just follow the on-screen instructions the first time you log in to the new online or mobile banking application. By default, your online banking user accounts are set up to require two-factor authentication on all external transfer of funds. This includes fund transfer and bill pay transactions. Two-factor authentication means you will be required to authenticate with something you know – your username and password – and something you have – a physical device such as a mobile phone. Click here for a complete set of digital identity guidelines published by The National Institute of Standards and Technology (NIST). If you are a new user, you will receive an invitation via email with a hyperlink that will walk you through the process of setting up your user account with out-of-band authentication. After logging in with your old login id and the last 4 digits of your SSN, you will be required to reset your password and set up security questions and answers. You may be prompted to accept the Terms & Conditions if you have not already done so. By default, out-of-band authentication is required for external transfers. If you do not perform external transfers and if you never choose to utilize two-factor authentication, the setup process still requires you to verify a phone number. If you are not using out-of-band authentication, you may use the phone number from a landline for verification. After verifying your phone number, you will be asked if you would like to use Duo for two-factor authentication. This option is highly recommended. 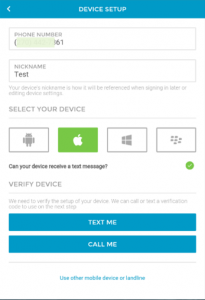 If you choose to use Duo, you will receive a text message on the device for the phone number previously verified. The text message will contain two links. 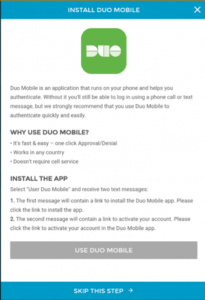 The first is a link to install the Duo Mobile app on your device. You can also install Duo Mobile from the App Store for iPhone and iPad or Google Play for Android. If you already have Duo installed, you do not need to click the first link. Once Duo Mobile is installed you will need to go back to the text message and click on the second link, Activate the DUO MOBILE APP. This link opens the Duo Mobile app. You must agree to allow push notifications. After you agree to allow push notifications, you will see First Bank Texas listed at the top of the screen. Now go back to your desktop or mobile device to complete setup. After setting up one device for use with Duo, you will be asked if you want to set up additional devices or complete setup. If you wish to add additional devices, the setup process is the same as setting up the first device. First Bank Texas brings you the latest in banking technology. The newest user-friendly ways to manage your finances from anywhere in the world!